Since Sensational Elora was conceived as the brain child of an amazing woman, Rhoda Lipton, we have been blessed with wonderful community support. 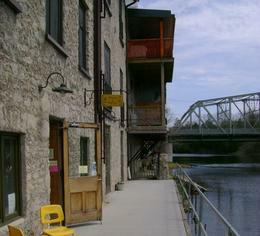 Our annual award-winning festival now organizes events throughout the year featuring the renowned music, art, film, food, scenery and unique small town character of historic Elora and Fergus. We strive to work with a wide variety of community partners to create fabulous events that showcase what Centre Wellington has to offer while we continue to raise funds to combat hunger in our community. We hope you will continue to read to the end of this newsletter as we describe some of our successful 2017 events and preview 2018 but first, we would like to ask you to consider joining our organization as a volunteer or a board member. We have recently experienced a couple retirements from our board and we are actively looking for new board members. We are a 100% volunteer organization with a working board. To ensure we are able to continue with the same success we have had in our first 10 years, we need some new blood. If you are interested or, if you have any suggestions, please contact us at info@sensationalelora.com or sign up on our website. Having fun while helping combat hunger in Centre Wellington; this is what it is all about. In our first 9 years, we have surpassed $110,000 in donations to the Centre Wellington Food Bank and Centre Wellington High School breakfast program (the food bank receives 90%). Our free events (Pumpkin Day and Monster March) have also contributed 100s of pounds of food for the Food Bank. Since starting our jazz series at Elora Centre for the Arts a couple years ago, we have also raised over $2,000 for the Centre. We could not have done any of this without the wonderful community support at our events, or the financial contributions from our sponsors or the generous donation of volunteer time at our various events including the continued donations of one-of-a-kind bowls from the many generous potters who continue to support our Empty Bowls project year after year and the soup-makers who contribute their time and their soups to our Sensational Soup-Off every Thanksgiving Monday. The combination of soup and empty bowls is our major fund-raiser every year. For those of you who could not attend our volunteer/sponsor appreciation evening, please accept our sincere gratitude now. 2017 was another great year for Sensational Elora. The photos above are a small sample of the events Sensational Elora organized throughout the year. - May 2017 'Film On A Plate' presentations of Maudie: It was a huge success, selling out the Gorge Cinema but unfortunately, it was a bigger success than we had planned for and we ran out of food. We truly apologize for anyone who did not get their full serving of food that evening. While we tried to compensate by offering additional free drinks, we know that it isn't the same and we promise that it won't happen again. - Jazz at the Centre:We had two wonderful Jazz at the Elora Centre for the Arts events in 2017; Aura Rully and Heather Bambrick. Both ladies were backed by some of the finest jazz musicians in Ontario. Regular attendees to our jazz presentations tell us they really like the "jazz club" atmosphere we create. Most of these shows are 100% sold out so we always recommend you buy early. - Our October events; Pumpkin Day, Sensational Soup-Off and Monster March Parade were all well attended again in 2017. - Pumpkin Day included a professional pumpkin carving demonstration, face painting, a bouncy castle, Zoomba and Highland Dancing demonstrations, face painting, popcorn and music, all for free. The generous folks from Mapleton Organics were also in attendance again, selling pumpkin ice-cream to raise money for the food bank. - Sensational Soup-Off/Empty Bowls We had a great mix of professional, amateur and youth soup makers competing for the title of "super-souper of 2017" and a one-of-a-kind soup ladle donated by Metallic Evolution, at our Soup-Off. A huge crowd of soup lovers came out to enjoy the soup and choose a bowl from our collection of Empty Bowls. We welcomed the Elora Arts Collective to the list of contributors to our Empty Bowls in 2017 to join the other generous potters who have been contributing bowls year after year. and Barb Murphy Pottery donated a beautiful growler to be raffled off as another fund -raiser for the food bank. As always, the wonderful generous musicians of the Elora Acoustic Cafe entertained for the afternoon and donated their fee to the food bank. - Monster March, the non-motorized parade through Elora that Sensational Elora assumed responsibility for a couple years ago keeps growing. The number of participants and the originality of costumes continues to get better and better (and the contributions to the food bank continue to increase). In 2017, we ended the parade at Bissell park with free drinks, popcorn and treats for all participants. - New in 2017 Sensational Elora adopted Tim Murton's famous Twilight Zoo, made possible by generous sponsorship by Pearle Hospitality, Sorbara Group of Companies and Your Grand Team Realty. Sensational Elora wanted to ensure that this unique Elora experience didn't disappear so we have taken on this challenging new project. In 2017, we started installing a few monsters in Fergus as well as Elora and our future plans include significant growth. We work closely with other community organizations for our Monster Month activities and expect great new features in the future. For our 10th anniversary year, we are in the early planning stages. 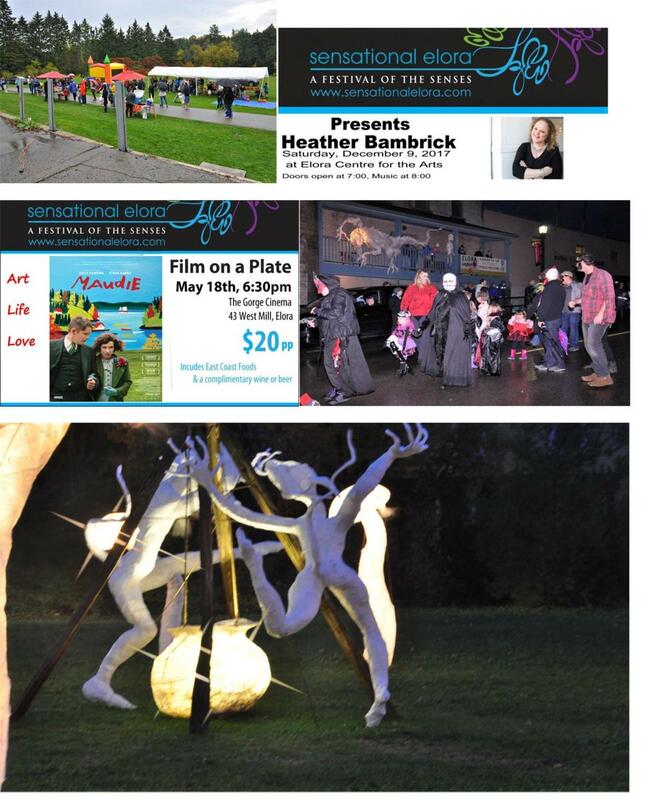 Currently, we know that we will have a Film On A Plate event May 17th at The Gorge Cinema. We will have more jazz, we are hoping to have Fabulous Fergus Pub Night again this year, perhaps a 2nd Film On A Plate (outdoors in the Elora Green Space), we will definitely schedule Pumpkin Day and Sensational Soup-off over Thanks giving weekend again this year and our Monster Month project will continue to expand but, it's too early in the planning to provide more details. Stay tuned to our web sites, www.sensationalelora.com and www.monstermonth.ca for details. Follow us on Facebook, Twitter and Instagram for updates.